Your phone case isn’t just meant to help protect your mobile device from drops and dings, it’s also an extension of your personality. It shouts who you are and what you’re about without you having to say a word. That’s why it’s important to know how to clean your phone case so you can make sure the oils from our hands and the dirt from the daily grind don’t turn it from a show stopper into an eyesore. 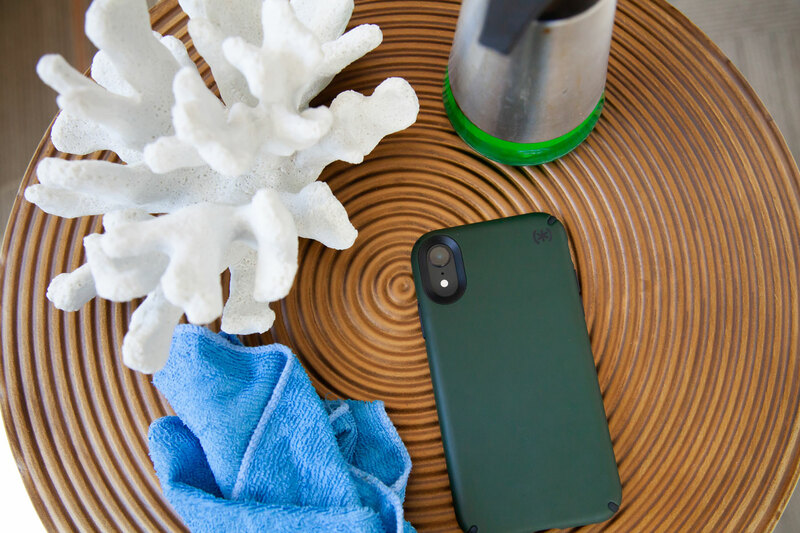 At Speck, we’re obsessed with phone cases (and everything phone technology,) and for that reason, we’ve compiled this simple, DIY process to cleaning your phone case that anyone can do from home. There are two different avenues you can take to cleaning your phone case, and it all boils down to how nasty the case is. Seriously, I managed to successfully clean my phone case with a little soap and some alcohol, and if I can, anyone can. Carefully remove your phone case from your phone. Never try to clean it with your phone inside. The water will damage your phone. After you’ve removed your case, make sure to put your phone in a safe place. We don’t want any accidents happening while you’re cleaning the case. If you have a two-piece phone case (one soft piece and one plastic piece) go ahead and separate the two and you can clean them individually. Once you have your case removed, grab a cup or bowl and pour around one to two cups of water inside. Then, take your dish soap and add one drop (max two drops) of soap to the water. Stir lightly until it is mixed. Take your soft cloth or soft-bristled toothbrush and soak it in the soapy water. Use the soapy cloth or soft-bristled toothbrush and scrub the exterior surface and the interior of the case in a circular motion. Make sure you get the tough-to-reach parts like the interior rings, the camera slot, and the button or charging port-holes. Rinse and repeat if necessary. This process should take away the first layer of grime fairly easily. If it doesn’t, try using the pencil eraser to get to those tough-to-reach spots. Once you’re finished cleaning the phone case, use a different soft cloth to wipe down your case so it can dry properly. Make sure to give the case a couple of hours to dry before you put it back on your phone. Now, if you’ve completed the above steps, and your phone case still has some leftover dirt or stains, don’t fret. Just follow the bullets below. Your stain takes a little more power to remove. Repeat steps 1 & 2 from above. Once you have your case removed, pour small amounts of the isopropyl alcohol onto another soft cloth and begin to scrub any remaining parts of the phone case. Make sure you’re getting the hard-to-reach places (like the edges of the case) where dirt and grime like to hide. The alcohol should remove the harder to fight stains and dirt. Once you’ve thoroughly scrubbed both the exterior and interior of the case, take another soft cloth (that’s dry) and wipe down the case until you’ve removed any leftover alcohol. Your case should feel dry to the touch. Give the case about an hour to two to let it dry before you put it back on your phone. If you’ve just tried the above two avenues to cleaning your phone case, and you’re still finding some tough stains or grime on the case, please try the below option. You’ve got some serious grime to get rid of. Once you have your case removed, cover any stain, dirt, or grime with small amounts of baking soda. Take a soft-bristled toothbrush and wet the bristles. Once it’s saturated, start to scrub any remaining parts of the phone case. Make sure you’re getting the hard-to-reach places (like the edges of the case) where dirt and grime like to hide. The baking soda should remove the harder to fight stains and dirt. Rise and wipe off any leftover baking soda with a fresh, soft cloth. After you’ve finished cleaning the case, give it about an hour or two to dry before you put it back on your phone. We hope these tips to cleaning your phone case have helped bring a little life back to your case. If none of these worked for you and your phone case is still grimy and dirty, I’m terribly sorry, but it may be time to hang that case up and put it out to pasture. One of the biggest issues with clear phone cases is that after a few months of use, they start to yellow and fog-up due to discoloration issues from UV rays and oil absorption. Only Presidio Stay Clear has a special coating that resists discoloration from these elements. Here’s some stylish phone cases that have drop protection to safeguard from impact, but they also have anti-microbial treatments that inhibit the growth of bacteria on the case. Bridging the gap between us and technology, one blog at a time.